As you can tell, our zoodle obsession is still going strong. Today, though, we bring you something slightly different. Zucchini Fettuccine with a delicious Alfredo made from – yep, you guessed it – cauliflower. Cue applause. Add some ham and mushrooms to the mix and you’ve got a winner! Fettuccine Alfredo is one of my all time favorite comfort foods. I love the simplicity of it – how a few simple ingredients packs so much flavor. 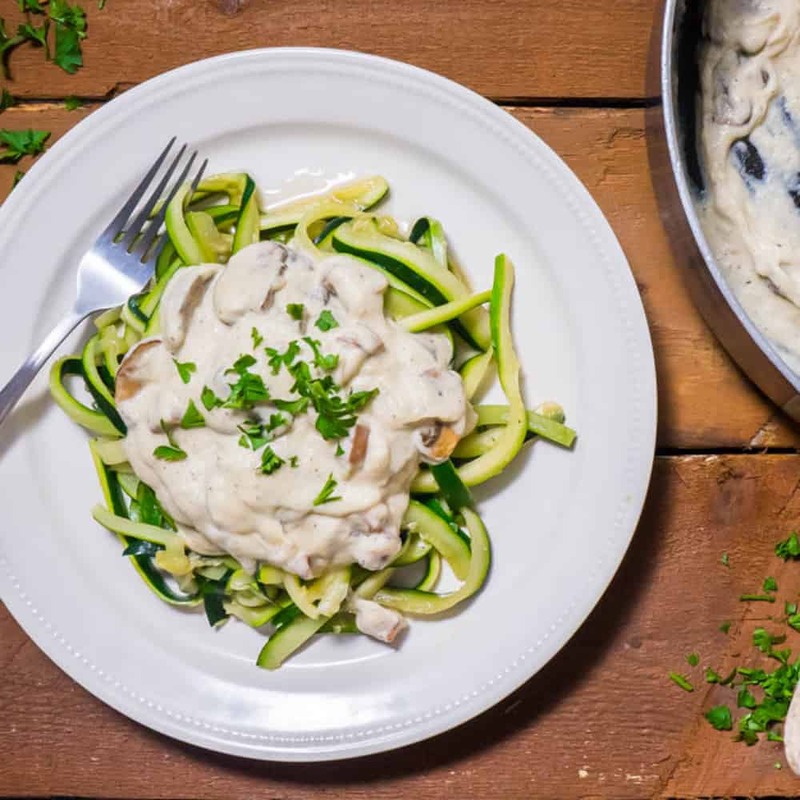 Now, believe it or not, I think this low carb Zucchini Fettuccine with Cauliflower Alfredo might have surpassed my love for the regular type, because there is zero guilt involved. Isn’t that great? Ahhhh… I just can’t get over the awesomeness of the low carb high fat life. Even though my pursuit for a 100% low carb/unprocessed life borders obsessive sometimes, I am by no means perfect. I have recently been experiencing a sudden insatiable craving for Mexican food – more specifically, chicken tacos (or tikken chacos as I lovingly call them). It doesn’t help at all that we seem to have a never-ending supply of Authentic Mexican Taquerias in this town *halp*. I just love food so damn much. The possibilities are endless, and now I’m on a mission to recreate everything using fresh, whole ingredients. Like our Very Veggie Lasagne – in that one I made a cauliflower béchamel! How amazing! Keep watching this space! Bring a pot of water to the boil and cook cauliflower florets for 10 minutes. Meanwhile, sauté the ham and mushrooms until nicely seared and set aside. Sauté the zucchini for a few minutes with a little bit of butter and season with salt and pepper until they are cooked to your liking. Set aside. Melt the butter and garlic together and put in a food processor with the thyme, cheese, cauliflower, cream, water from the pot you cooked the cauliflower in. Blitz until smooth. If the sauce is too thick, add more water. Season with salt and pepper to liking. Add the cauliflower back to the pan with the ham and mushroom to ensure everything is hot. Serve up a generous helping of zucchini fettuccine and top with the sauce. 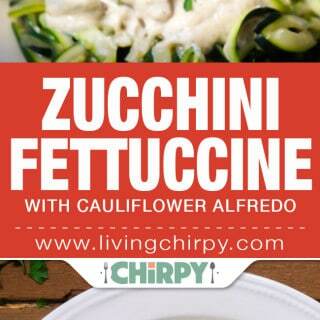 Zucchini Fettuccine with Cauliflower Alfredo – Pin it!